Despite their familiarity, mollies are much misunderstood fishes. They may be cheap, and they are certainly hardy and easy to breed when kept correctly, but in many ways they are not ideal fish for the community aquarium. Even defining 'a molly' is difficult, and things become even more complicated when trying to determine the ideal water conditions for these fish. One of the most common statements made about these fish is that they need to be kept in brackish water to do well; yet in the wild they are largely found in freshwater streams. So what is the truth about mollies? Genus Mollienesia: Mollies, five valid species. Bigger PIX: The images in this table are linked to large (desktop size) copies. Click on "framed" images to go to the larger size. Mollienesia velifera (Regan 1914), the Sailfin Molly. North America; southeastern Mexico. To six inches in length. Feeds on worms, crustaceans and plant material. The latter too often lacking in captive diets. Cond.s: pH 7-8, dH 13-19, temp. 25-28 C. Many aquarium varieties. An albino and wild-type Green male. 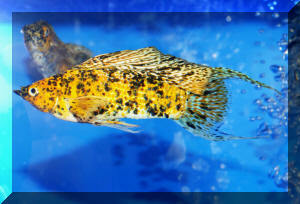 Mollies and guppies are very closely related, both being members of the genus Poecilia. Mollies had previously been placed in their own genus, Mollienesia, and it was from this that the common name 'molly' was derived. The name Mollienesia was coined in honour of FranÃ§ois Nicolas Mollien, a French politician of the late eighteen and early nineteenth centuries. Practically all the mollies sold to aquarists are hybrids of a number of species found across Central America and the southern United States. Although it is common to describe aquarium fish as being Poecilia sphenops or whatever, in reality the genetics of all commercially produced fish is hopelessly muddled and applying any sort of Latin name to them is completely pointless. It is possibly to identify the ancestors of the aquarium fish though, and doing so reveals some valuable clues as to the optimal conditions under which these fish should be maintained. Poecilia mexicana and Poecilia sphenops are two rather similar species both known as shortfin mollies. They are both rather variable in terms of colour, though typically greenish-silver with patterns of olive, brown, yellow, and black spots. It is often said, though not without any overwhelmingly compelling evidence, that Poecilia mexicana in particular was the 'rootstock' from which most of the aquarium strains of molly were derived by careful crossing with other species of molly displaying desirable features. 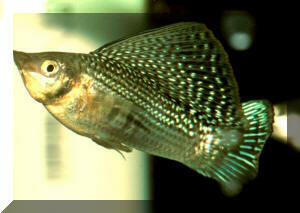 Two larger species are known as sailfin mollies, Poecilia latipinna and Poecilia velifera. Though males of all mollies have larger dorsal fins than the females, these two species have developed this attribute to a remarkable degree. On some males, the dorsal fin can be almost as long as the fish itself, and twice as tall as the fish is deep. Needless to say, such fish are very impressive animals, especially when displaying. The dorsal fin serves two purposes. Firstly, it is an honest indicator of genetic fitness. A big dorsal fin costs energy to make and reduces swimming ability by increasing drag, so any male that reaches sexual maturity carrying one around must have good genes or it would have starved by now, or been eaten by a predator. 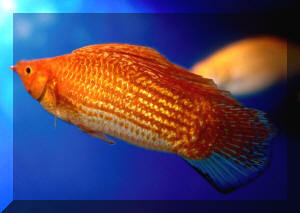 Females will select the males with the biggest dorsal fins, because they know they have good genes. The big dorsal can also be used to intimidate rival males: bigger fish tend to have bigger dorsal fins, so it is easy for males to judge one another's size. There's no point a smaller fish fighting because he's going to lose, so by comparing fins each fish can decide whether or not to press their case or swim away. A few other species may also played some rÃ´le in the development of the aquarium molly strains, most notably Poecilia salvatoris, a species known as the liberty molly in the United States thanks to its brilliant red, white, and blue colouration. Although not commonly traded, this beautiful fish does turn up periodically, as does the brackish water shortfin molly Poecilia gillii and the remarkable swordtail sailfin molly Poecilia petenensis. Besides the fact that aquarium mollies aren't any one species, muddying the waters yet further is the remarkable adaptability that mollies show in terms of environment. There really isn't any one definitive 'molly habitat'. Poecilia mexicana is found, for example, even in and around caves, where the waters are dark and rich in calcium sulphate. These cave-dwelling populations of Poecilia mexicana are pink and have relatively small eyes, but have highly developed taste receptors on the head and an enlarged lateral line system to compensate for the lack of light. Other mollies are found in estuaries and around mangroves, being well able to live in full-strength seawater without problems. For the most part though, mollies are inhabitants of freshwater streams flowing across coastal plains. The water chemistry is typically hard and alkaline, pH 7.5 to 8.0 and hardness 15-30Ë°dH. Although water temperature may vary depending on geographical location, most mollies seem prefer warm water environments and are most common where the water temperature is around 25-28Ë°C (77-82Ë°F). These streams aren't saline though, and while mollies certainly are found in brackish waters, that isn't their primary habitat. Mollies have been transported around the world and released into all kinds of environments. There are, for example, populations of mollies established in the marine Gulf of Thailand. Mollies have also become established in the United States in freshwater rivers and lakes far inland, where they can pose a serious threat to the survival of native fishes. 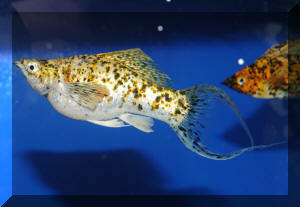 In these cases, the mollies concerned are hybrids very like those kept by aquarists (in fact, in many cases they were descended from aquarium fish turned loose by careless aquarists and fish breeders). Because they are so similar to the aquarium fish, these feral mollies demonstrate quite clearly that while mollies can live in brackish and salt waters, they are just as able to survive in freshwater environments as well. To salt, or not to salt, that is the question! If mollies can live in freshwater in the wild, why do so many experienced aquarists recommend keeping them in brackish water? To understand this, it is important to realise that marine salt mix does more than simply raise the salinity. Marine salt mix contains table salt plus a huge variety of other mineral salts, including a large quantity of salts that raise pH and increase hardness. The addition of marine salt to molly aquarium provides mollies with water chemistry much closer to that which they prefer and also acts as a buffer, inhibiting any subsequent water chemistry changes. Tonic salt can't do this, because it contains nothing by sodium chloride, a chemical that doesn't modify pH or hardness at all. An aquarist adding a certain amount of salt to the molly aquarium is effectively guaranteeing the correct water conditions without any need to mess about with pH buffers or water hardening agents. Plain table salt -- sodium chloride -- does have some useful functions though. It dramatically reduces the toxicity of nitrite and nitrate, a purpose for which it was put to extensive use in the early days of the hobby. Because filters were less efficient and water changes performed less often (on the theory that 'old water' was better) adding small amounts of table salt to freshwater aquaria actually did some good. Repackaged table salt, known as tonic salt, is still available to aquarists, though it has no real purpose in the modern hobby. After all, better filtration and more water changes are the best way to deal with poor water quality! But mollies do appear to be peculiarly sensitive to nitrite and nitrate, despite their widespread sale as beginners' fish. In saline water, the toxicity of these compounds is so much less that the fish come to no harm; in fact, mollies have been used for decades to mature marine and brackish water aquaria. But in freshwater tanks, they need excellent water quality if they are to do well. Salt, whether marine mix or table salt, is also an effective anti-parasite and antifungal medication when used in sufficient quantities. Teaspoon-per-gallon quantities, though often recommended, will have at most a marginal effect compared with commercial whitespot or fungus remedies. But once the salinity gets to a fairly high level, around 20-25% the salinity of normal seawater (SG 1.004-1.006) then most freshwater parasites find it very difficult to survive, and fungal infections tend to fade away quite rapidly. Mollies kept in around half-strength seawater (SG 1.012) will as good as never get infected with parasites because very few, if any, brackish water parasites have managed to become established in the aquarium hobby. By contrast, mollies kept in freshwater aquaria are extraordinarily prone to a number of diseases, including whitespot, fungus, finrot, and 'the shimmies' -- a neurological disorder that manifests itself as an inability for the fish to swim properly, instead the fish can only tread water, rocking from side to side. Though the absence of salt likely doesn't cause these problems, adding salt is certainly one way to deal with them. Low temperatures are likely a factor as well, because a fish's immune system will be optimised to work within a certain range of temperatures. The aquarium standard 25Ë°C (77Ë°F) is at the low end of what mollies enjoy, and it is probably this, coupled with poor water quality, that makes them so disease-prone in the average community tank. The good: Hardy, friendly fish full of charm, they even eat algae! Top of my list of almost perfect fish has to be the black molly. It's a spectacular fish when kept in a planted tank, the velvety black making a bold contrast with the green leaves. Even with more brightly coloured fish, it holds its own, and makes a superb companion for things like fancy platies and swordtails. Few other freshwater fish are as jet black as these mollies, and most of them are nocturnal. Even cichlids keepers -- usually spoiled for choice when it comes to colours -- don't have anything like the black molly; it's a truly unique fish. Like people, the physically most attractive fish aren't always the ones with the nicest personalities, but the black molly is every bit as friendly as it is beautiful. They won't even harm livebearer fry. Despite their peaceable natures mollies are remarkably bold, and will settle into a new aquarium almost at once, making them great dither fish for encouraging more nervous fish like cichlids and gouramis to come out from their hiding places. It gets even better -- mollies are very tolerant of nitrites, making them an excellent choice for maturing new tanks. Provided you don't overfeed them, they'll handle the entire filter maturation process without any problems; they are particularly valued in this regard by marine aquarists who use them instead of more delicate (and expensive) reef species. The icing on the cake is that mollies are fond of algae, and will happily graze on any green and thread algae in the aquarium. While certainly not in the same league as plecs or Siamese algae eaters (Crossocheilus siamensis), they do have an impact, and are especially good at cleaning delicate leaves where the larger, clumsier species can't reach. Really, the only shortcoming to the black molly is its need for hard, alkaline water. Of course, this isn't really a problem for aquarists in the South East, and is in fact something of a plus. Unlike all those neons and dwarf cichlids that demand soft and acidic water to do well, here's one fish that just loves standard issue London tap water. However, if you are keeping a soft water aquarium or have a planted tank with CO2 fertilisation, chances are the hardness and pH will be too low for the black molly. Ideally, this molly wants a pH of at least 7.5 and the water does need to be at least moderately hard. The addition of salt isn't strictly necessary, but many people have found that it does help to keep mollies healthy and free of diseases like fungus and fin-rot; in this case, raising the specific gravity to around 1.002-1.005 will do the trick nicely and allow you to mix in a few brackish water fish as well. Another problem with mollies is that they are more herbivorous than carnivorous, and evolution has primed them for grazing rather than gorging. Compared with standard tropical fish like tetras and barbs, mollies have very distinctive jaws featuring a unique set of hinges that allow for extreme protrusion of the premaxilla (the front part of the upper jaw). Both jaws are equipped with a single row of sharp teeth, and by pressing the mouth against solid objects and then extending and withdrawing the jaws, mollies can very efficiently scrape away diatoms, filamentous algae, and various other microorganisms. Algae are difficult to digest, but mollies have a long digestive tract that gives time for the digestive enzymes to do their work. So although what they prefer to eat is poor in protein and difficult to digest, there is at least plenty of it, and they can feed more or less continuously during the daylight hours nibbling away at algae and decaying plant matter. Of course mollies do eat a certain amount of animal prey, particularly the larvae of insects such as mosquitoes and midges. But in the wild at least such foods are a supplement rather than a staple. As with many other herbivorous fishes, such as surgeonfish and Panaque catfish, when given nothing but foods rich in animal proteins, such as standard fish flake, the overall health of the fish actually declines. Experienced molly breeders have also found that the more algae and vegetables in the diet of the mothers, the bigger and healthier their broods. In short, the serious molly keeper should be providing them with algae and algae wafers, soft vegetables such as courgette, and vegetarian flake foods. Bloodworms and live daphnia make excellent treats, but they shouldn't be used too often, once or twice a week at most. Yet again, the received wisdom jars with actual reality. Mollies may seem easy to breed -- they're livebearers after all -- but lots of people have tried and failed to rear broods of baby mollies. There's no real secret to breeding mollies of course, it is just that it isn't easy to do in community tanks, and mollies are far too large to be confined in breeding traps or nets. The best way to breed mollies is actually very simple. Keep them warm, healthy, well fed (lots of greens), and don't stress them. Stressed livebearers miscarry their broods, and though mollies are not quite as bad as halfbeaks in this regard, they're pretty close. Being confined in a breeding trap is one sure way to stress a female molly, and another is persistent attention from an unwanted suitor. In a small aquarium, removing the male once the female is pregnant is a very good idea, as his efforts to mate can stress the female. How can you tell if a female is pregnant? Frankly, you can it as read after the males and females have been together for more than few days. Otherwise, look out for an obvious swelling of the abdomen, and shortly before the fry are born, there is usually a dark patch around the vent known as the 'gravid spot'. Gestation varies somewhat, but is typically around a month. Litter size also varies, and in some cases over a hundred fry have been reported, with bigger females usually producing larger broods. The reason so few big broods get reported by inexperienced aquarists is that other fish hunt down and eat livebearer fry with remarkable enthusiasm. Sometimes, even the mothers will eat their own fry. In the wild, the fry would move into very shallow water where the adult mollies (and any predatory fishes) cannot go, so the females have never evolved any 'maternal behaviour' towards their offspring; as far as the female mollies are concerned, a baby molly is just a meal. The easiest solution is to install masses of floating plants: Egeria, Cabomba, hornwort, or whatever's handy. The baby fish will hide among the plants, and the aquarist can easily find and remove them to another aquarium where they can be reared safely. Molly fry grow quickly, but do need plenty of food. Algae-based flake food six times a day is ideal, and there should certainly be some algae-covered stones in the aquarium to let them go snacking in between their proper meals. Throw in some floating plants too, as baby fish generally enjoy a bit of shade and appreciate the sense of security that the availability of hiding places gives them. So pulling all these issues and observations together, it is obviously that mollies are much more demanding fish than most aquarists assume. But the key things to get right can be summarised fairly easily: All mollies need very clean water with no nitrite and as little nitrate as possible. The water needs to be warm, and hard, alkaline. Most aquaria are slightly too cool for mollies to really thrive, and the soft and acidic water the majority of aquarium fish enjoy is positively harmful to mollies over the long term. The addition of marine salt mix isn't essential -- but it will offset any lapses in water quality management and will raise the pH and hardness levels to where they should be. Table salt, or tonic salt, is perhaps better than nothing, but because it contains nothing to harden the water, it is far inferior to marine salt mix in terms of benefits. If you're going to add salt, the exact amount doesn't matter because mollies will accept anything from freshwater to full strength seawater, but in terms of benefits against cost, aiming for 20% seawater (SG 1.004) would be about right. At this salinity, your freshwater-adapted filter bacteria will not be harmed, and the amount of salt needed would not be very great, about 7.5g/l (1oz/gallon). All this would seem to make mollies incompatible with community tropicals, and to some extent that is true. But, although things like tetras and Corydoras probably don't have any place in the molly aquarium, there are plenty of fishes that will thrive in the warm, hard, alkaline water these fish need. Almost all of the New World livebearers enjoy these conditions, and most will even tolerate small amounts of salt if necessary. Other freshwater fishes tolerant of such conditions include glassfish and wrestling halfbeaks. At SG 1.004, a nice variety of unusual brackish water fishes could be kept as well, including bumblebee gobies, Brachirus sp. soles, and orange chromides. The violet goby Gobioides broussonnetii would be an especially interesting addition, coming from the same parts of the world as the mollies and inhabiting the same sorts of waters. Of course, the serious molly aficionado appreciates that mollies are perfectly capable of being fascinating and rewarding animals kept all by themselves. 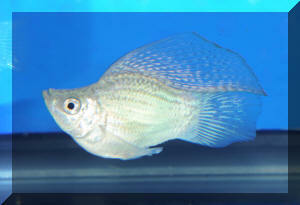 Though sadly misunderstood, mollies remain wonderful fish well worth getting to know better.